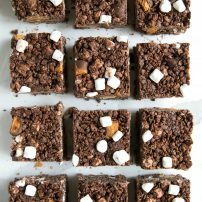 These Chocolate Peanut Butter Rice Krispie Treats are a fun, festive, and chocolaty twist on the classic, much-loved Rice Krispie Treat Bars. 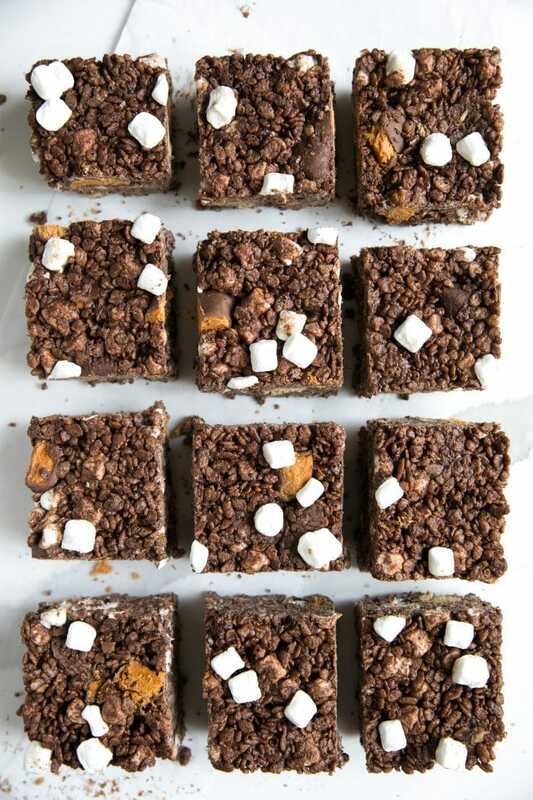 Made with chocolate rice cereal, mini Butterfinger candy bars, peanut butter cups and, of course, marshmallows, these awesome and delicious peanut butter Rice Krispie treats are all the sweet memories of childhood rolled into one easy treat. Just kidding. That child of mine is in it just for the marshmallows. Regardless, these sweet little cereal bars are a little piece of happiness and a whole lot of memories. Basically, think of all the healthiest things in the world and mix it all together. Just kidding. This is not diet food, but that ok! For today anyhow. Step 1. 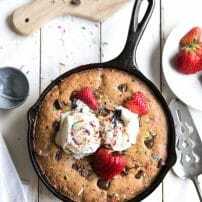 Line a large 9 x 13-inch pan with parchment paper. Guys, this is super important. Why? Because it makes removing your delicious peanut butter Rice Krispie Treats from the pan a piece of cake. Step 2. 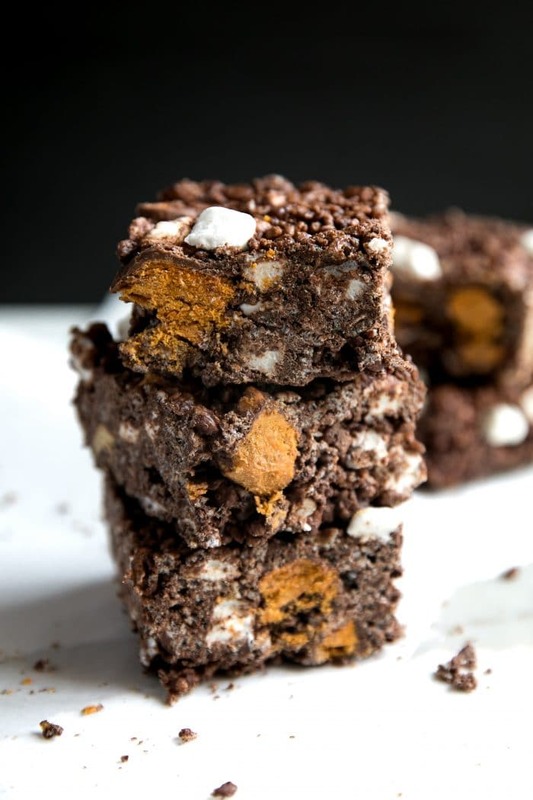 Mix together the chocolate Rice Krispies, mini marshmallows, and halved Butterfinger bars. You’ll need a big bowl for this. Probably the biggest one you’ve got. Step 3. Melt the dark chocolate. You can do this using a double boiler (my preferred method) or in the microwave. The double boiler method always gives smoother, silkier results with less room for error. As the chocolate begins to melt, stir continuously with a wood spoon taking care not to allow any steam or moisture to escape from the pot below. Step 4. With the chocolate almost melted, stir in the peanut butter, honey or maple syrup and ground cinnamon. Gently stir until fully combined. Step 5. Remove the fully chocolate peanut butter mixture from the heat and allow to cool slightly before pouring directly into the bowl with the rice cereal. Mix the you-know-what out of it. Transfer to the prepared pan and press firmly into the bottom. Refrigerate for at least 4 hours. Regular Rice Krispie cereal will taste great, but I highly recommend the chocolate version. Go big or go home, my friends. 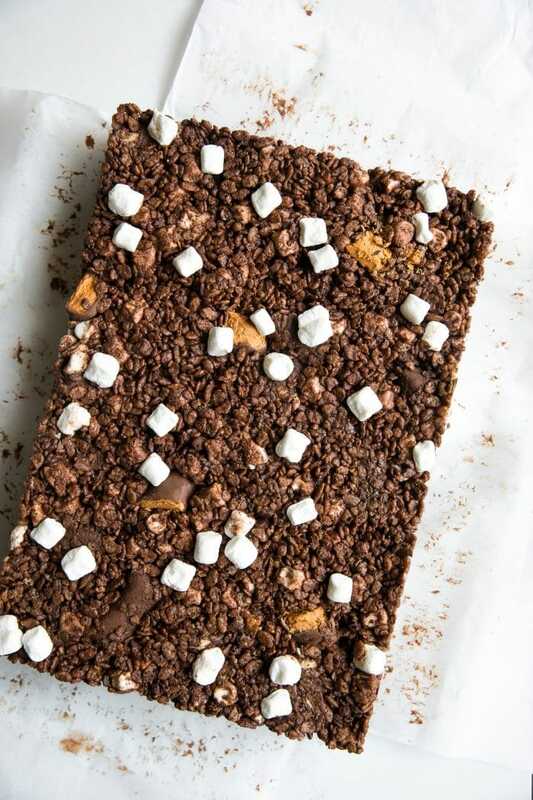 Keep the Butterfinger bars big and chunky. In other words, I highly recommend that you do not just crush the Butterfingers into small bits. Store these beauties in plastic wrap to keep them fresh for as long as possible. Let them cool and set in the refrigerator for at least 4 hours. It is chocolate and chocolate likes to melt. Use a large piece of parchment paper to help evenly distribute and press down on the Rice Krispie mixture. 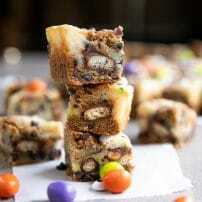 Made with chocolate Rice Krispies, mini marshmallows, mini Butterfinger bars and peanut butter cups, these Chocolate Peanut Butter Rice Krispie Treats are a fun and delicious twist on the classic, and much-loved Rice Krispie Treat. Line a 9x13 inch pan with parchment paper and set aside. 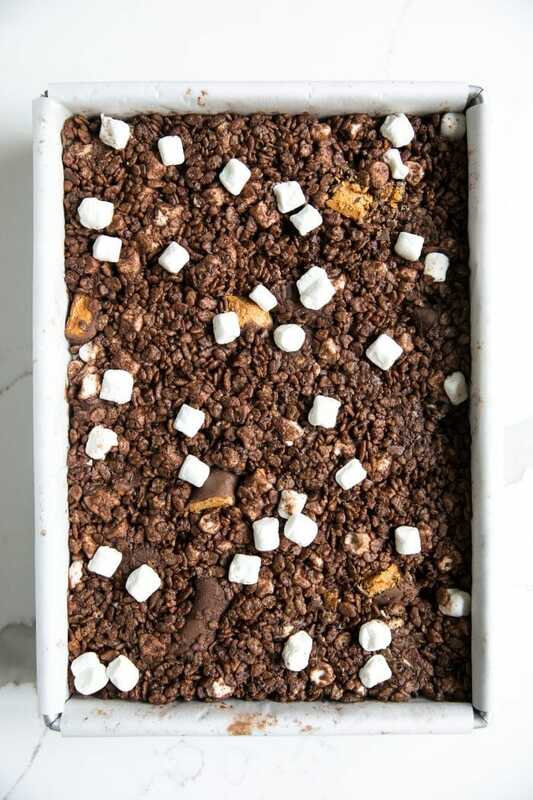 In a large mixing bowl combine the chocolate Rice Krispies, mini marshmallows, halved Butterfinger bars and quartered peanut butter cups. Gently toss to mix and set aside. In the top pan (or bowl) of a double boiler over low heat add the chocolate. 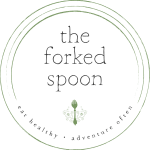 As the chocolate begins to melt, stir continuously with a wood spoon taking care not to allow any steam or moisture to escape from the pot below. With the chocolate almost melted, stir in the peanut butter, honey or maple syrup and ground cinnamon. Gently stir until fully combined. Remove the melted chocolate peanut butter mixture from the heat and set aside to cool for approximately 5 minutes or so. 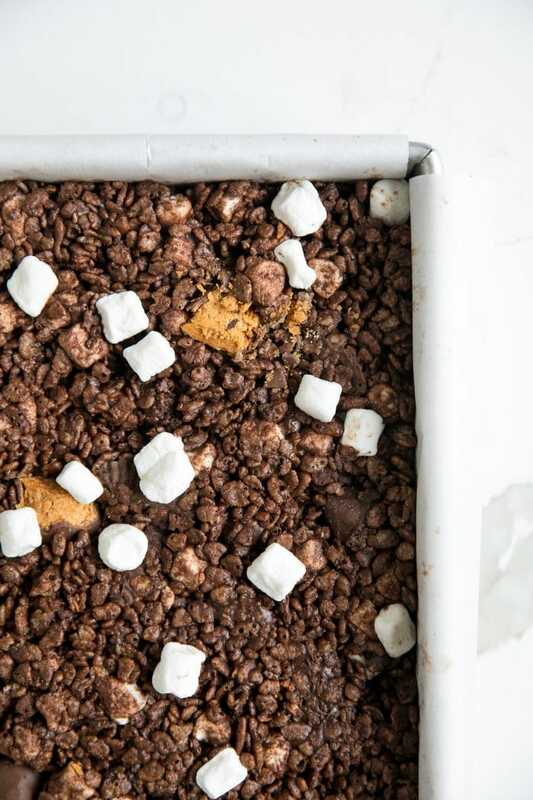 When cool enough to handle, pour the chocolate mixture directly over the cereal mixture, stirring to evenly distribute the chocolate and peanut butter with the dry ingredients. Scrape down the sides as needed. Transfer mixture to the prepared pan and press firmly into the bottom. Cover and refrigerate for at least 4 hours to overnight. When fully cooled remove from the pan and cut into desired number of bars. Enjoy! 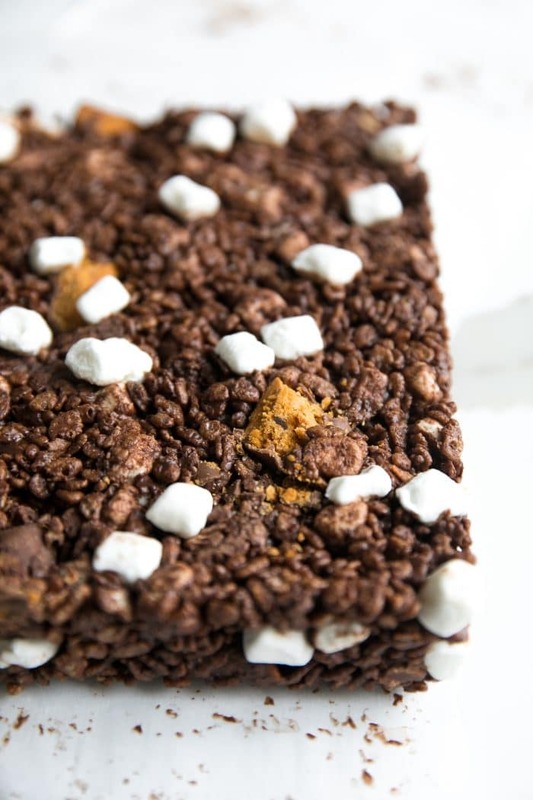 Want to try this Chocolate Peanut Butter Rice Krispie Treats? 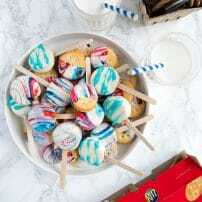 to your “Dessert” or “Halloween Candy” Boards on Pinterest and save it for later! 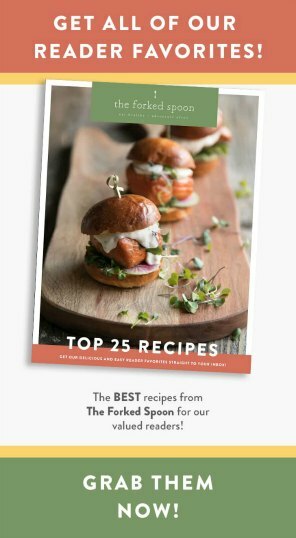 Great recipe – so yummy!